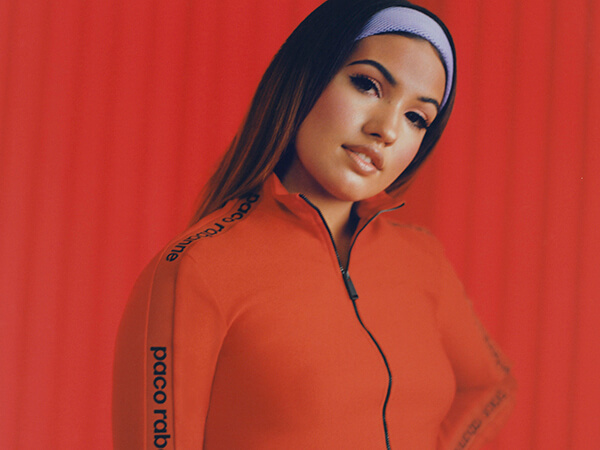 After carving out a reputation as one of the UK’s hottest new talents with bangers like “Finders Keepers” and “Fine Line,” Mabel caught lightning in a bottle with “Don’t Call Me Up.” Produced by Steve Mac, the feisty, bass-heavy breakup anthem has been a massive hit across Europe (100 million Spotify streams and rising) and is starting to take off in America. In fact, streaming and radio numbers are so healthy that a debut on the Billboard Hot 100 is inevitable at this point. And that’s without a solitary TV performance or sync. I was lucky enough to attend Mabel’s recent showcase at Gold Diggers nightclub in Los Angeles and then ask some questions about the success of “Don’t Call me Up.” The outrageously talented daughter of Neneh Cherry and Massive Attack producer Cameron McVey opened up about recording her breakout hit as well as the major differences between working a record in the UK and the US. She also shed some light on the direction and composition of her debut LP. Get to know the breakout star a little better in our Q&A below. I saw your showcase in LA. You were great. Thank you so much! Such bad timing. I got so ill that day and I’m still ill. It’s crazy. I got a cold, and it turned into a sinus infection, then a chest infection. It’s kind of lingering, it doesn’t want to leave me alone. But it’s all good. It didn’t seem to affect your performance at all. Everyone was really into it. I know, right? You just never know with those kind of things… how the audience will respond, but I thought the energy was really positive. The reason for your US promo trip is “Don’t Call Me Up.” That song has really taken on a life of its own. It has. It grew its own little wings and it’s flying me places now. It’s so cool. What was it like working with Steve Mac on the song? He’s amazing, obviously. It was so exciting to work with him. It was our first session. We only had a day. It was me and Steve and the amazing Kamille. I guess I went in to the studio with the intention having a good time and doing my best. And then, it just happened. Sometimes it does, sometimes it doesn’t. We were just having a good day and it all came together quite quickly. I went in with the subject matter that I want to discuss and it all just fell into place. Can you elaborate on the song’s theme? I was just trying to capture that emotion of when you’re over somebody, and how good that feels. You know? Yeah, I feel like everybody has been there. When they run back to you, but it’s too late and you just don’t care anymore. It’s literally the best feeling. When you recorded the song did you sense that it was going to be big? No. I really liked it and it definitely felt different. I’m always looking to evolve as an artist, and as a writer, and I knew that we had taken my sound somewhere new sonically. So, I definitely was excited when I heard the record for the first time. I knew I wanted to put it out. But when I finish a record, it’s up to the label. It’s up to the fans. It’s not on me anymore. Like you said, the song just took off on its own. Which is the best way, the only way really. I had no idea that this was going to happen. The song is really clicking in the US. Is this market a major priority for you? For sure. I’m still figuring everything out. I have been more focused on the UK. But it’s definitely important to me to come here. I would love to be successful everywhere and, obviously, America is a big piece of that puzzle in terms of the global market. I’m excited to just see what happens. Will there be more US promo on the horizon? I’m wrapping up my album now, but when it’s done and out, then I definitely want to come here and do shows. The shows are always different depending on where you are. I’m so lucky that I get to go to all these different places because of my job. I’m really excited to come back. You mentioned the album. Will it be all new songs or will you include some older material? I think mainly new stuff, but there might be a couple of older ones. But there’s a lot of new material. There are so many bangers on (mixtape) Ivy To Roses. I hope songs like “Finders Keepers” make the cut. I’ll see what I can do! It’s super possible. It’s difficult because I’m emotionally attached to the songs. There are a lot of big decisions to make. I’m very adamant that I want to give fans new things and tell them a story. You can hear that it all goes together. I think I have a strong team of people that I work with, and they will always remain, just like a unit, a family unit. But I have been recording songs in LA with some different people, so it has some different sounds. But nothing that’s not me. It all goes together. Have you thought about your next single yet? Have you noticed any major differences between the US and UK markets? Everything takes so much longer over here. In the last couple weeks, I have been going to different cities and dropping into different radio stations. I realized how long it takes to break a record out here and how difficult it is. It’s really interesting. Did you always want to get into music? You come from a very musical family. I definitely always enjoyed creating music and writing songs. It had always been my passion. Then I put music out and it kind of just ended up becoming my job. It wasn’t really the plan, it just happened. Was there a moment where it dawned on you that this is really happening for you? I think when “Finders Keepers” went top 10, that was really cool. Going top 10 in the UK is a big deal. That was a really exciting moment. I feel like a lot of things changed after that record. You have already worked with some amazing people. Who else is on your wishlist? I would love to work with Pharrell Williams. That would be a dream come true. How did you discover Mabel’s music? Let us know below, or by hitting us up on Facebook and Twitter!